California’s extraordinary weather and incredible natural resources provide many opportunities to enjoy the great outdoors. Have you always wanted to go whale watching? You can do it here! Does a hot air balloon ride over Wine Country’s green, rolling hills sound like fun? Go for it! The Golden State is literally chock-full of breathtaking mountains, wild coastlines, meandering meadows, grand lakes and unique deserts just waiting for your explorations. There is virtually no California area not blessed with an embarrassment of riches for you outdoors adventures enjoyment. …(plus Mojave, which most people think of as one of the California National Parks but is technically classified as a National Preserve), 19 National Forests, 14 National Monuments and 280 State Parks in which to enjoy the unparalleled California outdoors adventures! Some of the adventures and activities available to you at this vast collection of protected natural and cultural sites include whitewater rafting, horseback riding, fly fishing, houseboating, snow skiing and boarding plus “plain old” hiking and camping. Then, of course, there’s “luxury camping” – which may sound like an oxymoron that couldn’t possibly exist in real life. Believe it or not, though, it exists in California! Sequoia High Sierra Camp, nestled on a wooded hillside overlooking Kings Canyon in the Giant Sequoia National Monument, offers 36 deluxe, Tuscan-inspired canvas bungalows with beds that feature plush-top mattresses, down pillows and triple-sheeted linens. Maid service and three bountiful meals are included in the daily rate, and there’s no extra charge for the luxury of having no televisions/telephones! Wherever you go to enjoy activities and adventures in California’s great outdoors, it’s a good plan to dress in layers. Do remember to bring your camera… and don’t forget the sunscreen! 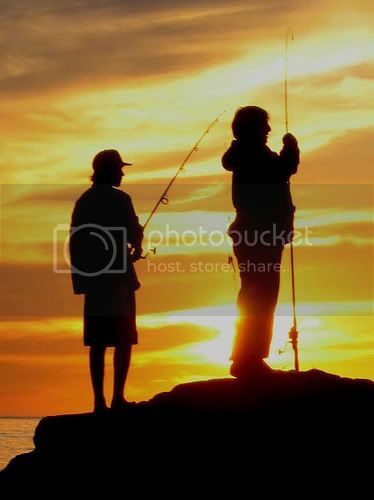 Photo of California Fishing at Sunset by moonjazz via flickr (Creative Commons).